Shopping Cart Fall Accident, Injury, and Recovery | Hupy and Abraham, S.C. The answer to your question is going to depend on why your child fell out of the shopping cart and who knew—or should have known—specific facts prior to your child’s accident. 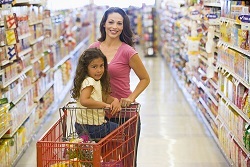 Who’s Responsible for the Accident: The Store, the Shopping Cart Manufacturer, or You? Generally, the store may be liable for your child’s injury if the store’s staff knew or should have known that there was an unsafe cart in the facility. For example, if a store worker had seen the cart wobbling or another customer had complained that the cart wasn’t working right, then the store could be responsible for any injuries that result from the broken cart. The shopping cart maker may be responsible for your child’s injury if there was a problem with the design or manufacturing of the cart. Additionally, the manufacturer may be liable for failing to provide warnings, such as weight limits, on the cart. Similarly, if proper safety restraints were not in place or were not functioning to industry standards, the manufacturer may be liable. You, or the grown-up in charge of your child at the time of the accident, may be liable for your child’s injury if the child was standing in the cart, shaking the cart, or otherwise acting unsafely and in such a manner as to cause her accident. If you think that the store or shopping cart manufacturer caused your child’s injury, then it is important to take action quickly to protect your child’s rights. You can schedule a free consultation with an experienced child fall injury lawyer today and we can take action to preserve any video surveillance of the accident, to make sure the cart in question is not repaired before it can be examined, and to help your child get the recovery that she deserves. To learn more, please call our experienced fall injury lawyers today at 1-800-800-5678.